Preheat coconut oil on medium heat in a medium sized oven safe pan, I used cast iron. Meanwhile, place eggs and milk in a bowl and whip with a fork for 1 minute. Add remaining ingredients except the mushrooms and nutritional yeast. Stir to combine. Pour the mixture into the prepared pan and top with sliced mushrooms. 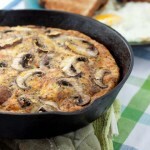 Allow the frittata to cook for 10 minutes. 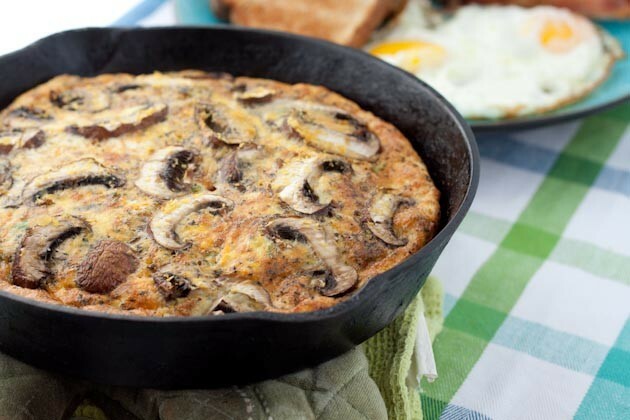 Remove the frittata from the oven, sprinkle with nutritional yeast and set the broiler of your oven to low. Slide the frittata under the broiler. The oven rack should be around 6″ away from the element and watch carefully until the top is golden about 5 minutes.